The Awen first on our list of 10 ancient Celtic symbols. In the Celtic language, the word “Awen” means essence or inspiration. For pronunciation, it can either be said as “ah-when”, “ou-when”, or “ah-oo-en”. A neo-Druid symbol whose invention is attributed to an 18th-century Welsh poet named Iolo Morgannwg. The Awen symbol is fairly simple in design. Consisting of three rays leading up to a path to a high point of three dots all why surrounded by three circles. One interpretation is main outside lines are symbolic of both man and women while the inside line represents balance. See below what a typical Awen symbol should look like. 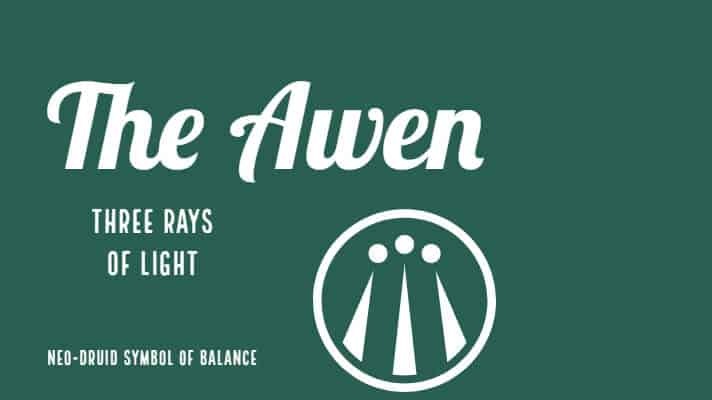 By far the most popular meaning of the Awen is three rays of light. The number three is a very sacred number not just in Druidry but also in Celtic culture. The meaning of each ray of light has different meanings in culture. The three circles surrounding the symbol indicate the cyclical and timeless nature of these trinities as well as the three circles of creation. Thanks to Neo druidism adopting it is as their official symbol it has become very popular in modern times. A typical Celtic Awen pendant. You can find the Aen in many tattoos, jewellery and clothing. If you enjoyed learning about this symbol visit and learn about these other Celtic symbols. If you are interested in Celtic Tattoos, the Celtic Cross is another popular symbol. Celtic Thunder sings “Amazing Grace,” and the crowd rises to their feet in glory.